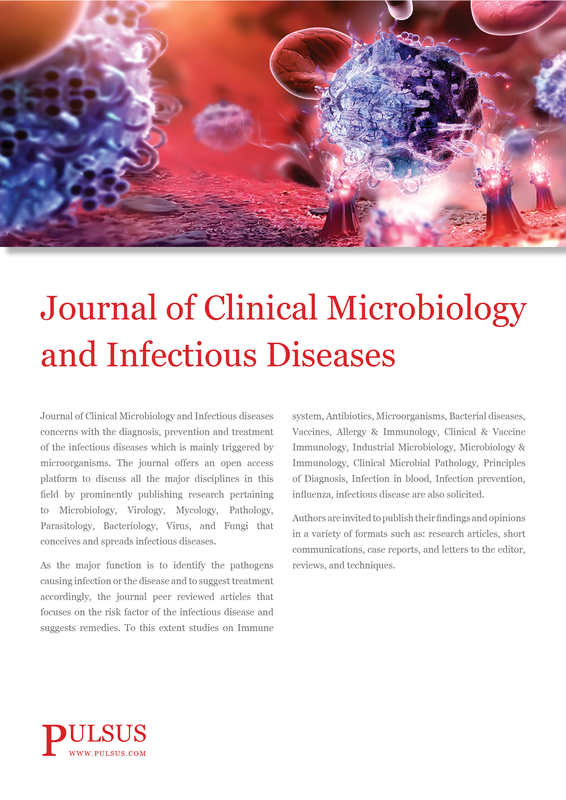 Journal of Clinical Microbiology and Infectious diseases concerns with the diagnosis, prevention and treatment of the infectious diseases which is mainly triggered by microorganisms. The journal offers an open access platform to discuss all the major disciplines in this field by prominently publishing research pertaining to Microbiology, Virology, Mycology, Pathology, Parasitology, Bacteriology, Virus, and Fungi that conceives and spreads infectious diseases. As the major function is to identify the pathogens causing infection or the disease and to suggest treatment accordingly, the journal peer reviewed articles that focuses on the risk factor of the infectious disease and suggests remedies. To this extent studies on Immune system, Antibiotics, Microorganisms, Bacterial diseases, Vaccines, , Allergy & Immunology,Clinical & Vaccine Immunology, Industrial Microbiology, Microbiology & Immunology, ,Infection in blood, Infection prevention, influenza , infectious disease are also solicited. Authors are invited to publish their findings and opinions in a variety of formats such as: research articles, short communications, case reports, and letters to the editor, reviews, and techniques.